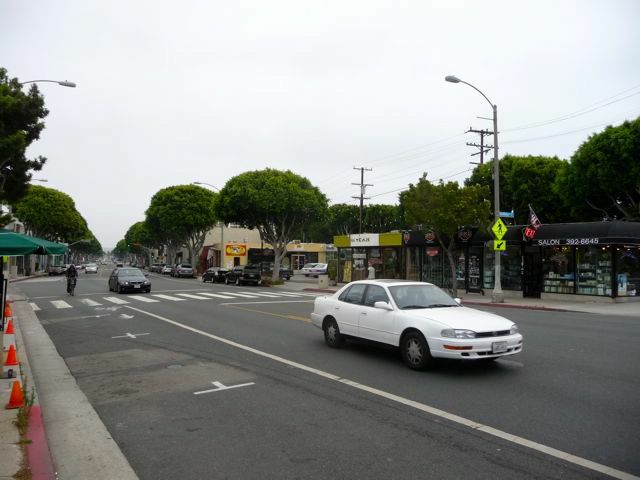 Main Street in Santa Monica is a commercial district two blocks from (and paralleling) the Pacific Ocean. With a variety of architectural styles (including the 1927 Parkhurst Building pictured above), large street trees, few stop lights to slow down your pace, numerous one-of-a-kind businesses, and a very temperate climate, it's an excellent - and very easy - urban hike. This past summer I had a breakfast meeting at the Omelet Parlor on Main Street - and figured I could get a one hour walk in (even with camera in hand). I parked some distance away, near the corner off Main Street & Marine Street, right on the Venice/Santa Monica Border, and headed northwest up Main. 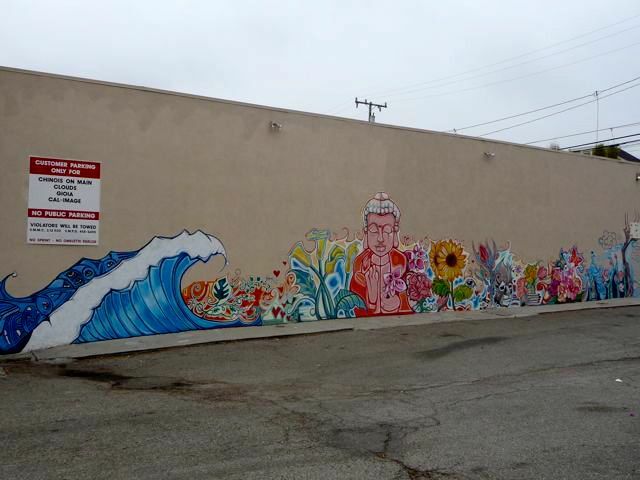 Corner of Main & Marine. 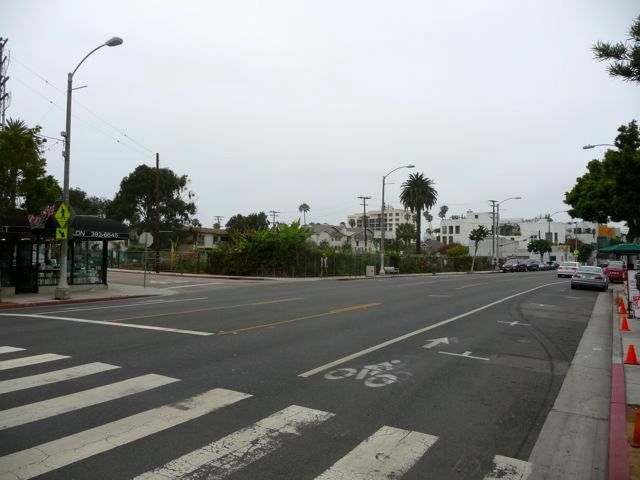 My sister use to live in this neighborhood, the beach is only two short blocks from here. 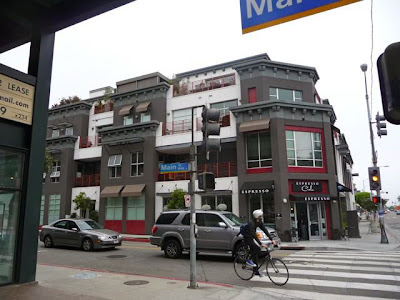 Contrasting building and architectural styles across the street. 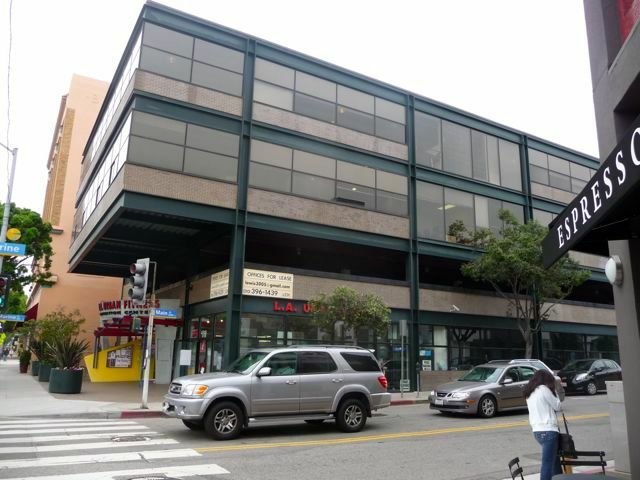 Another view of the Parkhurst Building at Main & Pier. 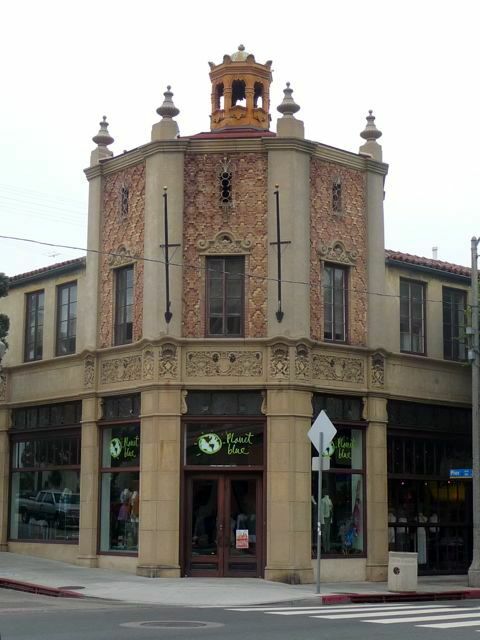 I've always loved this building. It was built in 1927 and is on the National Register of Historic Places. 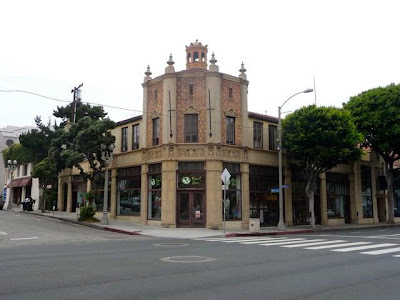 It's also known as the Flea Market Building, the multi-sided tower is an excellent example of the Spanish Colonial Revival style. Just beautiful. Street trees, storefronts right up to sidewalk, and cool morning temperatures made for a great walk. T-shirt in the store window: "California . 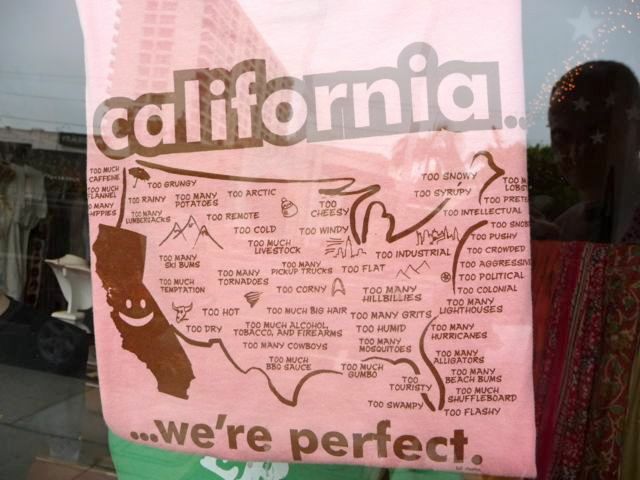 . . we're perfect"
I don't even think the majority of Californians would agree with that statement, especially in 2011. The "Animal Wellness Center" - Main Street, Santa Monica's answer to the neighborhood pet store. According to their website: "A veterinary hospital? A retail store? 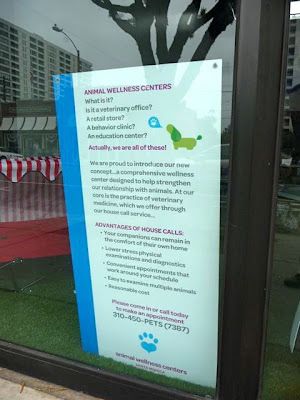 An education center for pet owners? Actually, we are all of these." 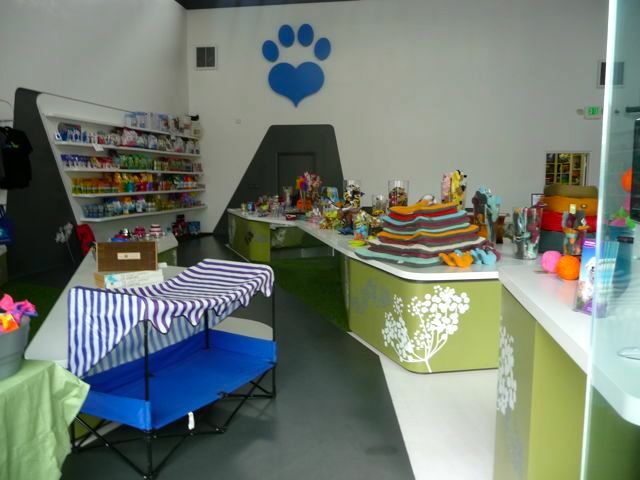 Wow, this place is nicer than most stores designed for children. Maybe that's because some people treat their pets better than some people treat their kids. Just wondering if this stuff is for pets? Or for their owners? 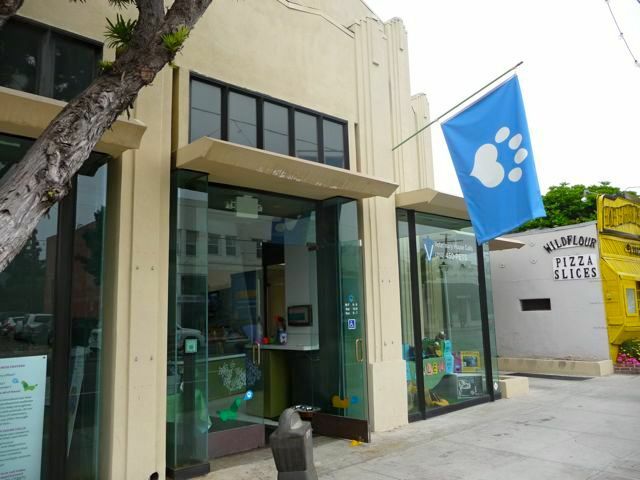 Guess that's why our family shopped at Petco over on Wilshire. The Omelet Parlor in between Ashland and Hill. I wanted to get to Pico Blvd. and back for a breakfast appointment with my co-workers. White people will often say they are “spiritual” but not religious. Which usually means that they will believe any religion that doesn’t involve Jesus. Popular choices include Buddhism, Hinduism, Kabbalah and, to a lesser extent, Scientology. A few even dip into Islam, but it’s much more rare since you have to give stuff up and actually go to Mosque. Mostly they are into religion that fits really well into their homes or wardrobe and doesn’t require them to do very much. 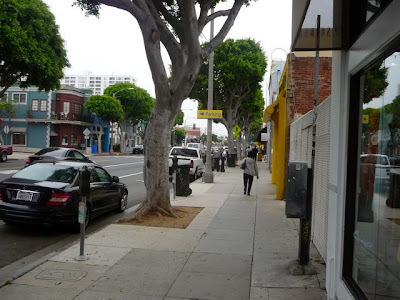 In fact, this entire stretch of Main Street reminded me of the Stuff White People Like blog. Really worth reading if you're not familiar with it. 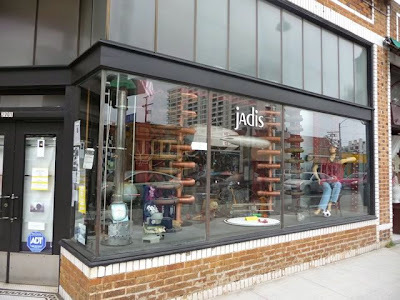 Jadis, a prop rental store, is without question the most unique business on Main Street (how many neighborhoods have "prop stores"?). Jadis is stuffed full of original Bausch microscopes, Tesla coils, medical mirror arrays, and antiques of every imaginable sort. Jadis is rarely open to the public. [True - I've NEVER seen it open]. The shop is by appointment only, often just for prop rentals. But on the days the door is open it's well worth the dollar contribution to step inside and look around. 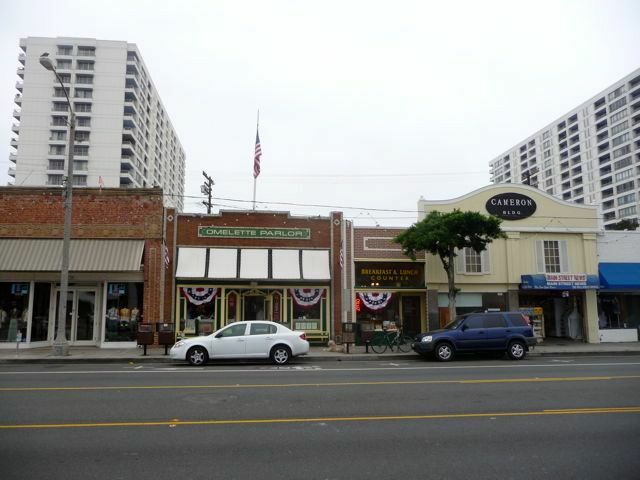 Across the street is the California Heritage Museum, located on the corner of Main & Ocean Park Blvd. More on the Museum in Part II (next week). 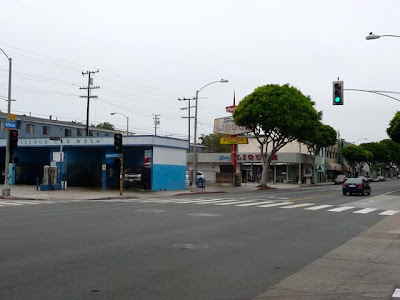 Crossing Ocean Park Blvd, the businesses on Main Street change up a bit for a block or so - looking a little more typical to what you'd find in an average American city: a car wash, a liquor store, stuff like that. Hollister Ave. - I had to take a picture. 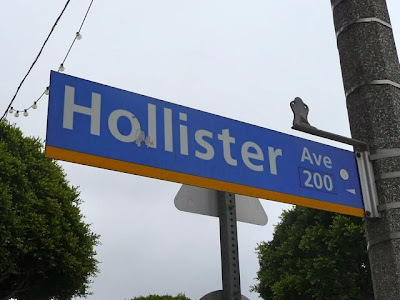 I had assumed that the Hollister Clothing company took/borrowed/stole the name from the city of Holliser, California, but apparenty there are also cities named Hollister in Florida, Idaho, Missouri, Oklahoma, Wisconsin, and North Carolina (reminds me of the fictional town "Springfield" from the Simpsons). I say took/borrowed/stole because according to a 2009 article in the Los Angeles Abercrombie & Fitch (parent company of the Hollister Clothing line) has threatened merchants and residents of Hollister, California who want to use the name "Hollister" on clothing made in the town of Hollister. A company spokeman said "If they try [to use our name] they would get a call and much more." According to the article, "even students at Hollister's San Benito High School wonder if they are violating Abercrombie & Fitch's trademark by wearing shirts emblazed with the school nickname, the Hollister Haybalers." I'm surprised that Abercrombie & Fitch hasn't sued the City fo Santa Monica for this flagrant violation of their brand name - and force them to change the name of this street. 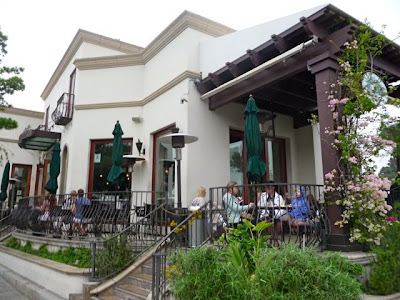 Further up the street, Urth Cafe. I met someone here for coffee a couple years back. Really funky. 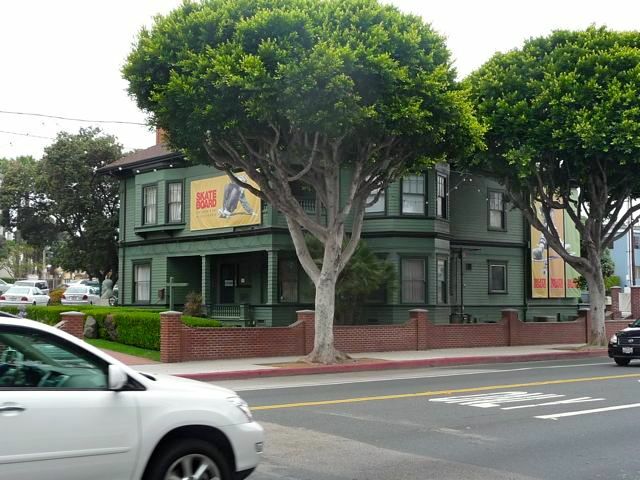 If you want a Main Street, Santa Monica experience, stop by the Urth Cafe. Urth makes Starbucks feel like a Denny's. The Santa Monica Community Garden. 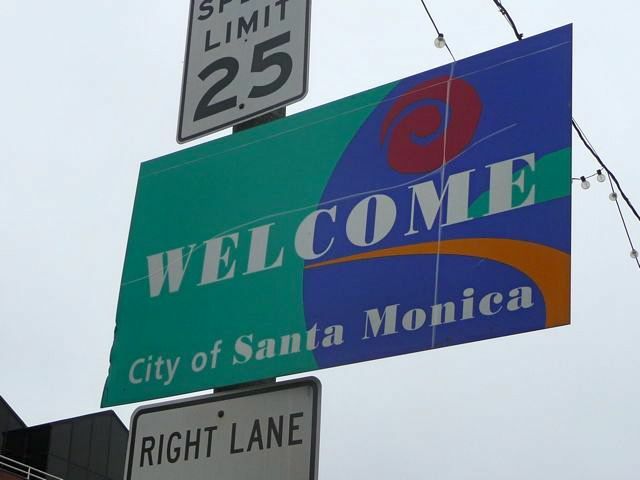 Established in 1976, the community gardens has 69 garden plots available for rent to Santa Monica residents. More on this in Part II (next week). Looking back down Main Street towards the southeast. Another view looking the same direction southeast towards Venice, with the apartment towers of the Marina del Rey visible in the distance. 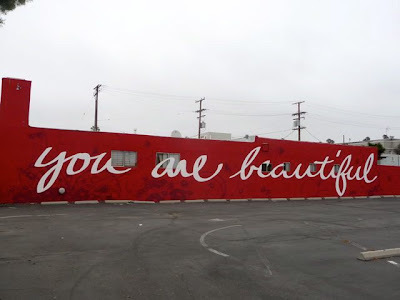 Street mural: "you are beautiful" - guess that's true, unless you're ugly (or - like most of us - average). 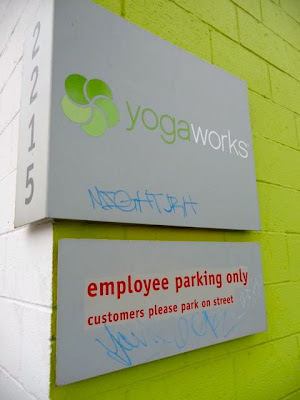 Although its origins are from India, one can find more yoga studios in white neighbourhoods such as Kitsilano or Orange County than in Kolkata. Participation in this activity requires large amounts of money and time, both of which white people have a lot of. Like other stuff that white people like, yoga feels exotic and foreign (ties into post #2 about eastern religions) and deep down in some way, white people feel that participation makes up for years of colonial rule in India. Friends in other parts of the country have described their communities as having "a church on every corner." In contrast, parts of Santa Monica feel like they have a yoga studio on every corner. 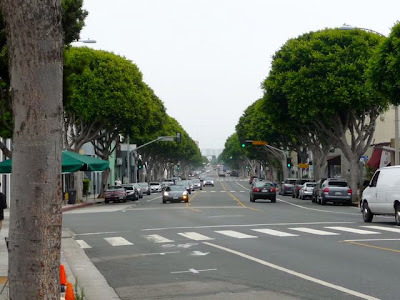 More on Main Street, Santa Monica in Part II next week. You have so good photos, but where are your California sun and sunshine? 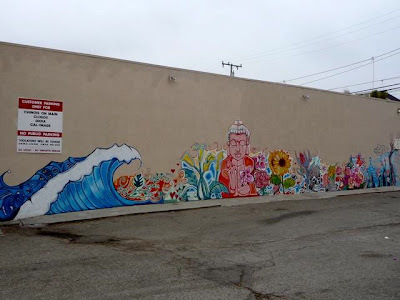 ExperiencingLA.com is on Blogger (owned by Google). Simple, but free. I've also used Wordpress elsewhere, which allows you to create more of a website, with tabs.